On Durmitor you have a chance to eat a healthy diet. When we say “healthy“ we do not mean cereals or a purely vegetarian diet, although there are dishes on restaurant menus intended for vegetarians, we mean food which has been produced in an organic way. Raising livestock was the main reason for settling in this area and remains to this day as a key source of livelihood for many of the inhabitants living in the villages. Farmers on Durmitor primarily breed sheep, in the spacious pastures of Jezerska plateau and Durmitor itself. In addition to sheep, many households breed cows. 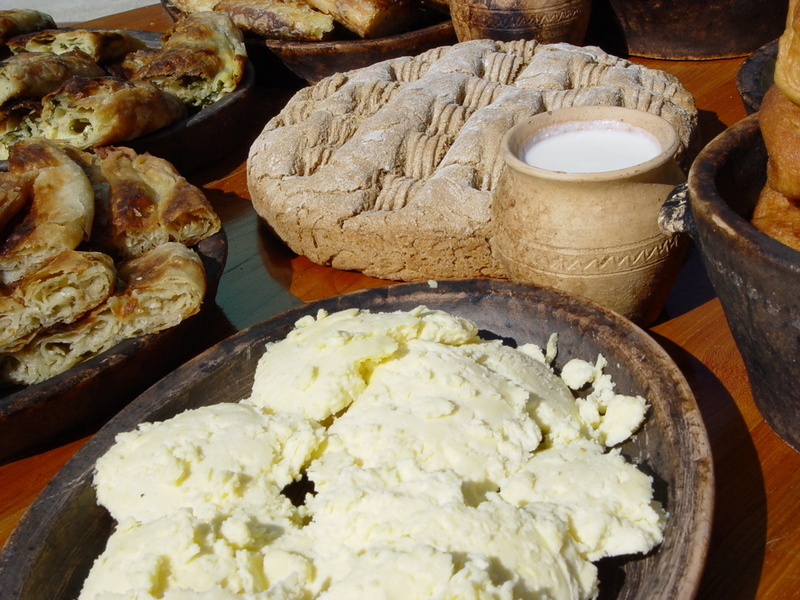 Milk and dairy products, of sheep and cow, together with meat, were basic food for the local population. This type of diet is not quite recommendable nowadays, however, if one takes into account physically strenuous life and long, cold winters, it becomes clear that any “lighter”, more modern diet would not be possible here. The cattle bred by the local population feed almost exclusively on fresh grass from pastures in the katuni, on the mountain, which has not been fertilised with any chemical substances, and which has grown naturally, without man’s interference. This type of fodder, self-grown grass, flowers and medicinal herbs on which animals here feed is extremely rare worldwide, especially in Europe. 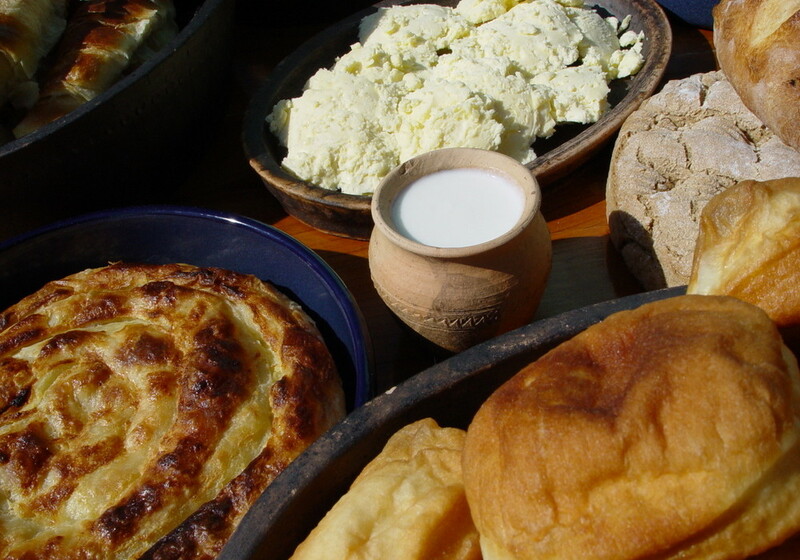 Thus, since our livestock are breed on Durmitor in such a manor, we suggest, unless you are a vegetarian, you order dishes made of locally-produced meat and dairy products. 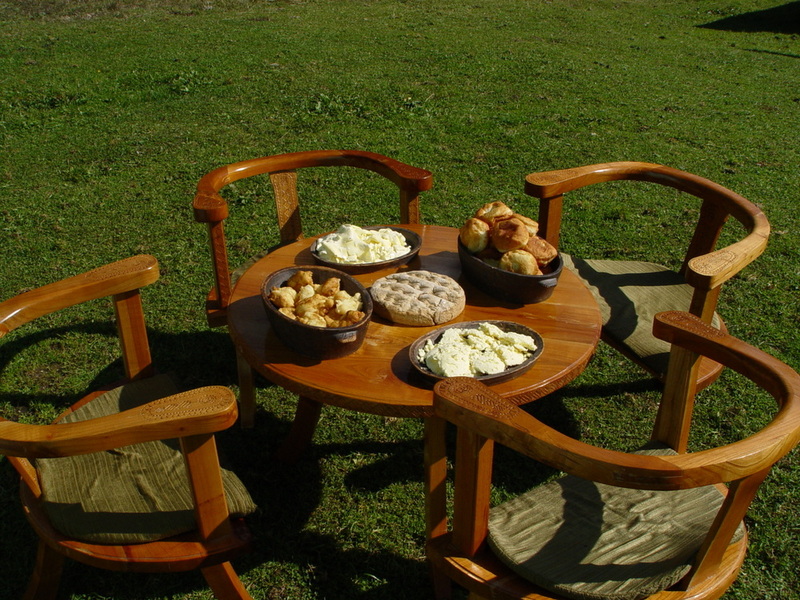 Below, you can find information recommended food and restaurants in Durmitor. Alternatively, for a quick summary of what food and drink to order locally check out or Top 10 page by clicking HERE. 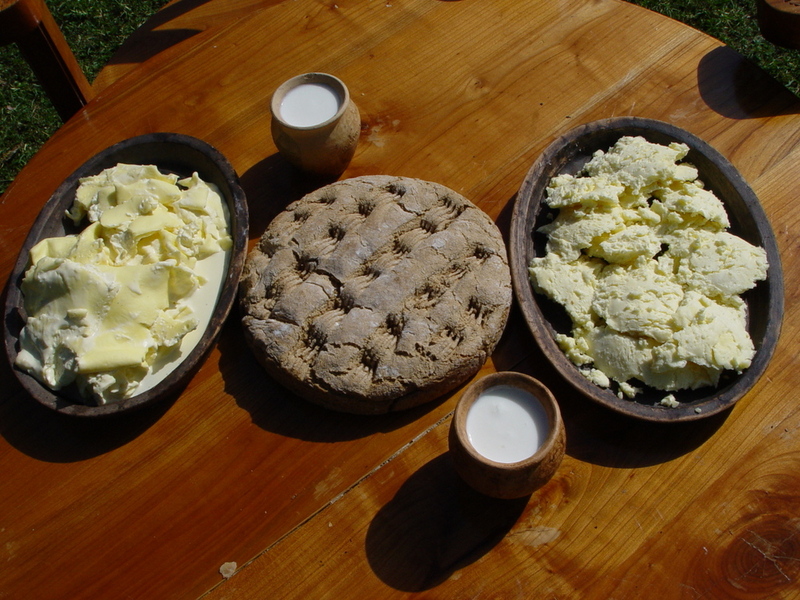 As far as dairy products are concerned, a traditional product from this area is called “skorup” which can be made of sheep or cow’s milk. 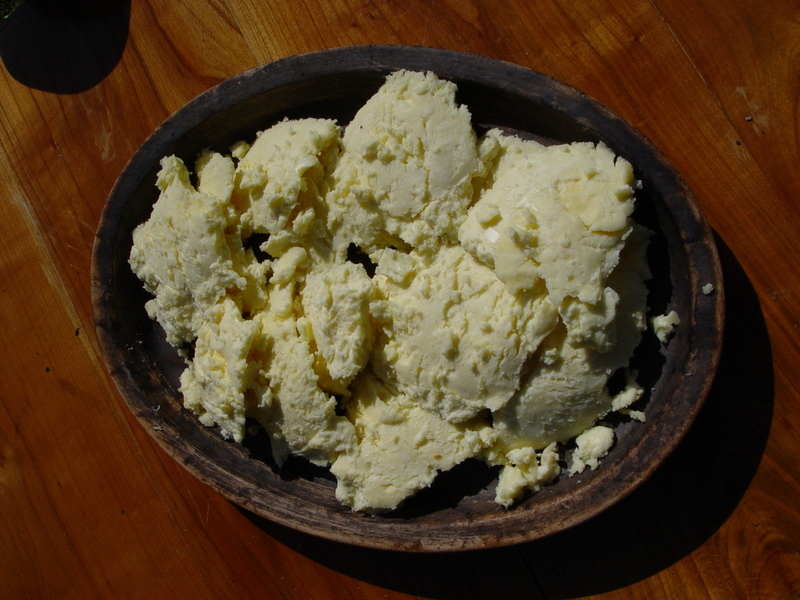 The one made from sheep’s milk is white, whereas the other is yellowish in colour. Skorup is actually a greasy film which forms on the surface of boiled milk as it gets cold. 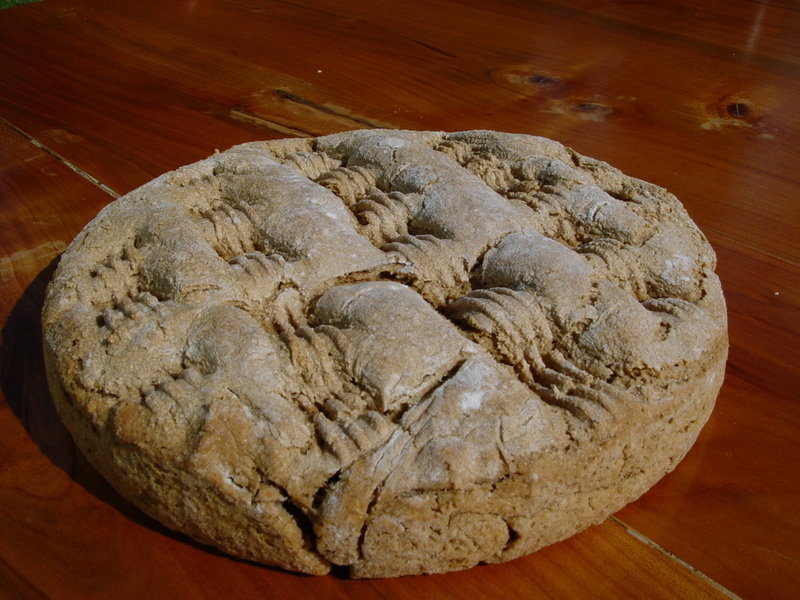 It is then removed from the milk’s surface, is salted, stacked, left to dry out through a long process, and finally kept in wooden crates, or in a sheep’s paunch, in order for it to be preserved through the winter. 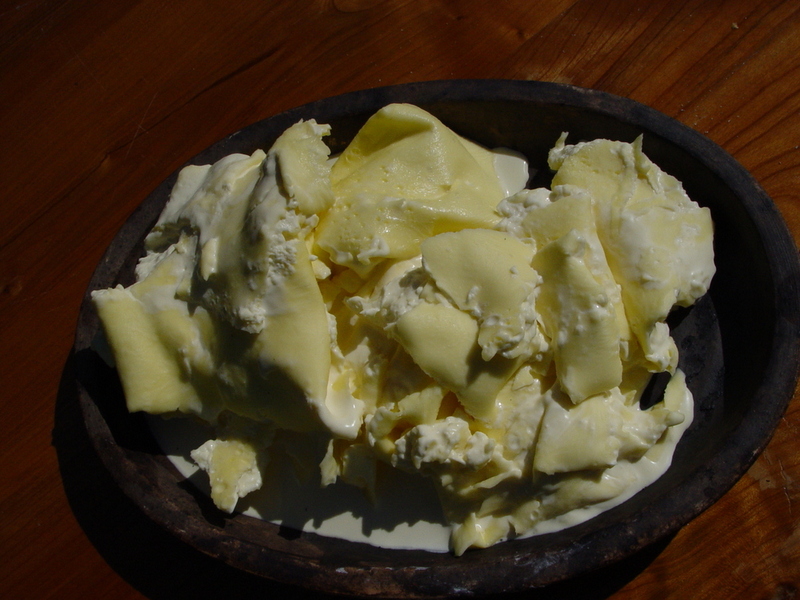 If the greasy film is removed from the milk and immediately served, without salt and a bit dried out, usually rolled, the resulting dish is called “saljevak”. Saljevak is just perfect! Do not miss out on at least one breakfast which will comprise warm, homemade bread, saljevak and honey. 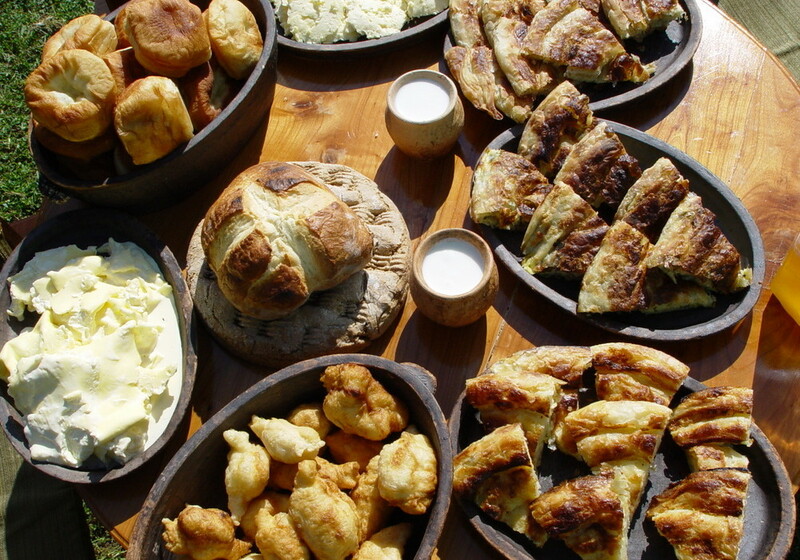 We recommend: a sunny morning, 10am, terrace of the “Momcilov grad” restaurant (7km from Zabljak, on Stuoc hill, 1800m above sea level; you can get there by your own car, by taxi, or if you are keen on long morning walks, on foot. Bear in mind that the height difference is 300m, so the walk is not an easy one! 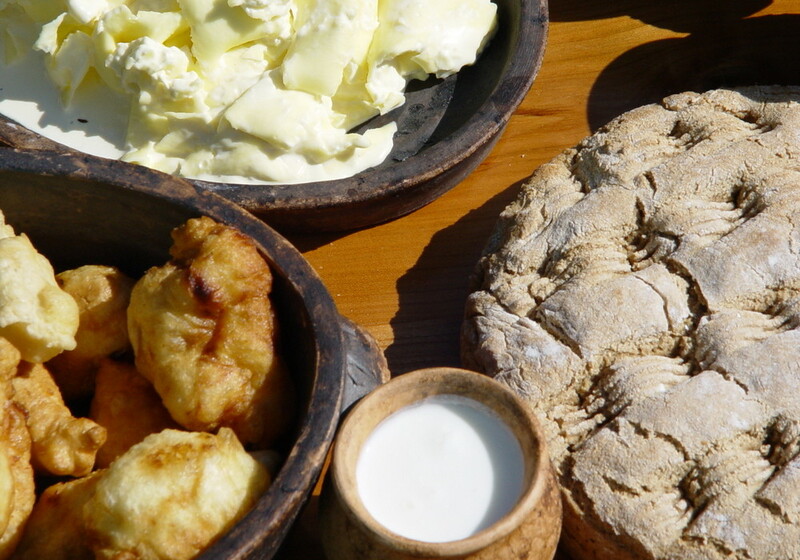 Try saljevak with honey and hot bread, and if you would like to have something salty as well, before saljevak, order buckwheat pie (pita od heljde) with cheese or skorup. Saljevak and skorup served in this restaurant have been awarded an organic food certificate. 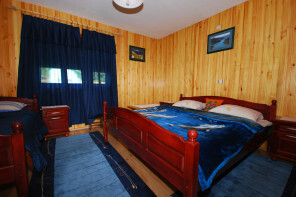 With a million-dollar view of the Durmitor massif, the Black Lake and the whole plateau all the way to the Tara canyon, a perfect food and kind personnel of the restaurant, we are sure you will have an enjoyable time. In “Momcilov grad” restaurant do not miss out on the collection of old, black and white photos. From “Momcilov grad” you can get to the Jablan Lake in one hour. 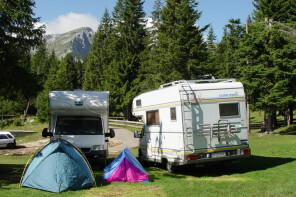 What a perfect way to burn calories and see more of Durmitor’s wonderful landscapes! 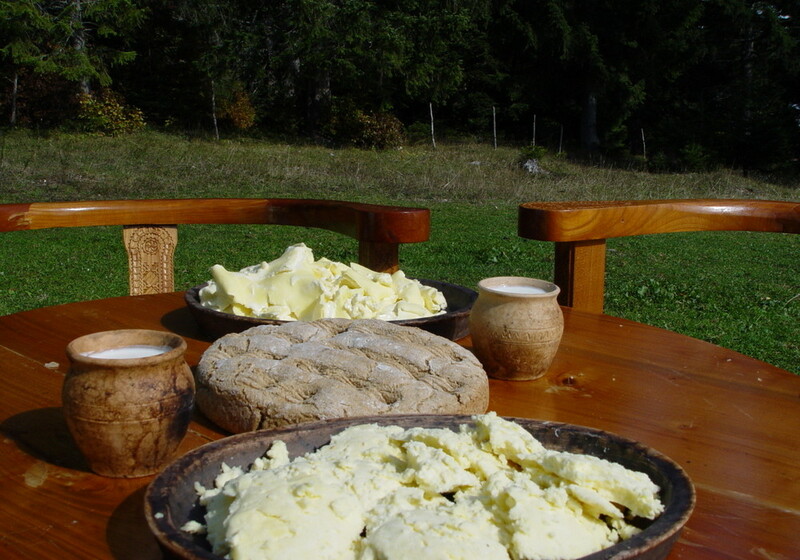 In addition to skorup and saljevak, milk is processed into white cheese (fresh or old), into “prljo” cheese (fat-free, salty cheese, produced from boiled milk from which skorup has been removed), into sour milk and “grušavina”, boiled, salted, sheep milk, which is produced in August. 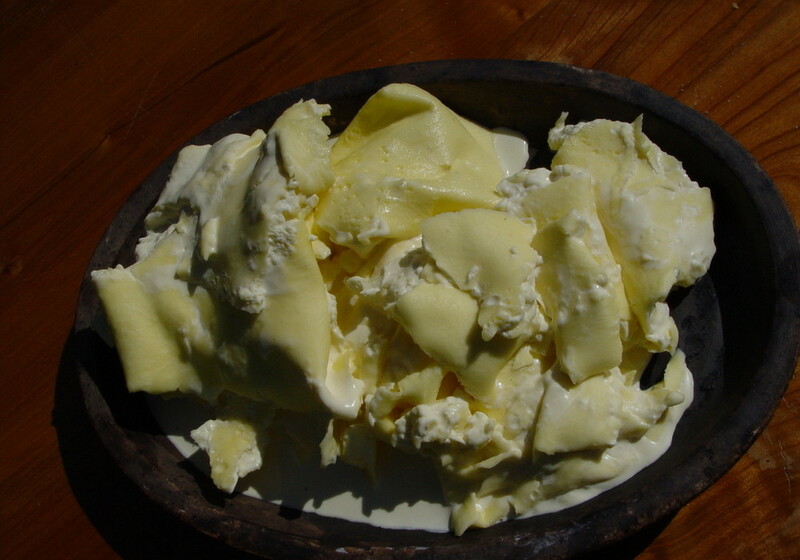 In addition to white fatty cheese and prljo cheese, in some shops you can find white “soft” (meki sir) cheese, produced in a special way, which has a layer structure and is very tasty. 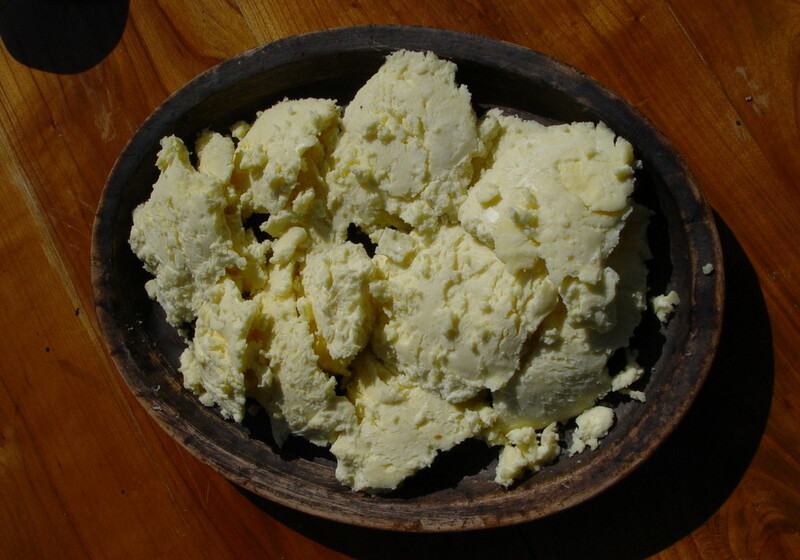 Ripe, hard and dry types of cheese are not traditional in this area. 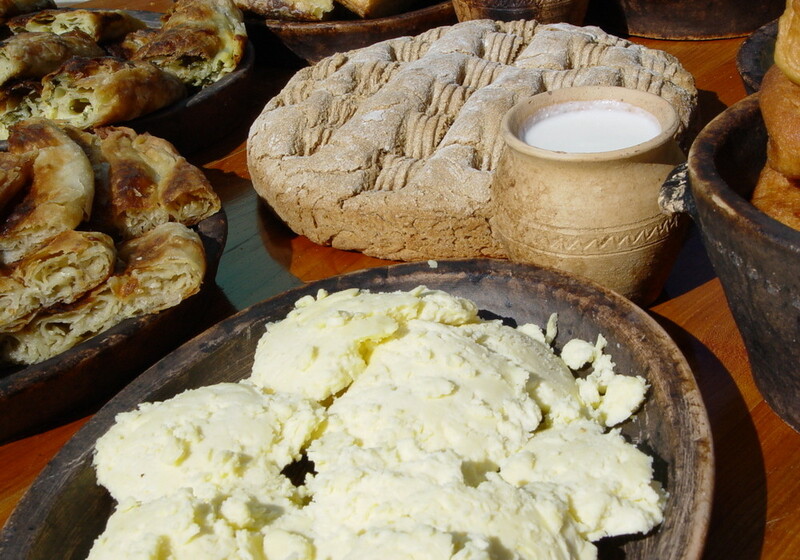 Besides restaurants (such as Momcilov, noted above), homemade dairy product can be bought in local grocery stores and at the town marketplace. The town marketplace has the best offer on Thursdays, which is market day, but every day, in the basement of the building, you can buy homemade dairy products of excellent quality, including fresh sheep milk. The price of skorup, saljevak and prljo with the organic food certificate is, understandably, higher than the price of the same products without the certificate. “Momčilov grad” restaurant, which we have just mentioned, belongs to the same company which owns the farm for organic food production, so organically-certified lamb is served in the restaurant as well. 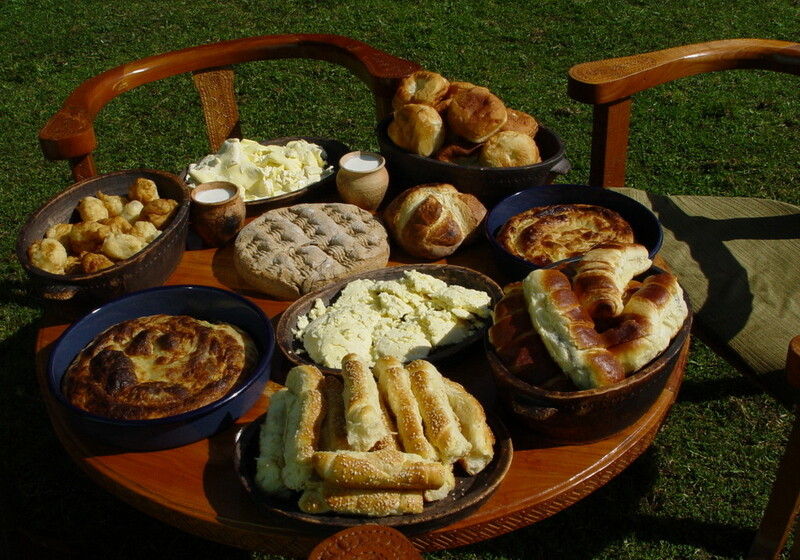 Besides fresh meat, dry meat, fish and dairy products, Durmitorians often have Flummery pies (kacamak) and gruel (cicvara) on their table. 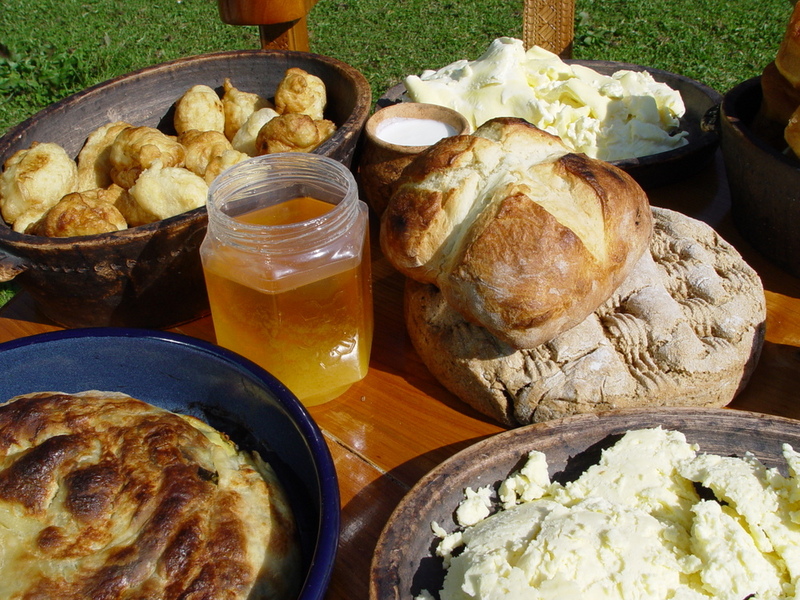 Pies are made from homemade crust, cheese and skorup, but they can be also made from spinach, meat and potatoes. 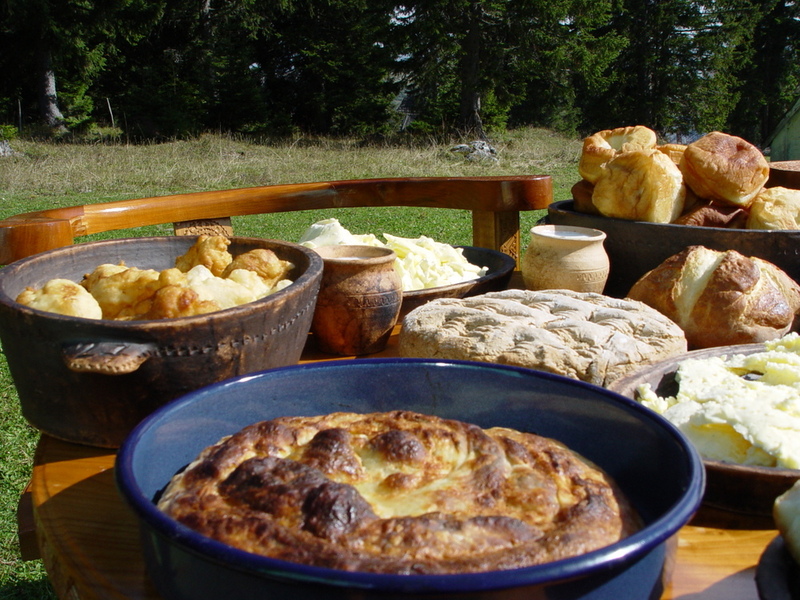 Trying a pie on Durmitor is a must! Flummery and gruel are two similar dishes with a base of corn flour. 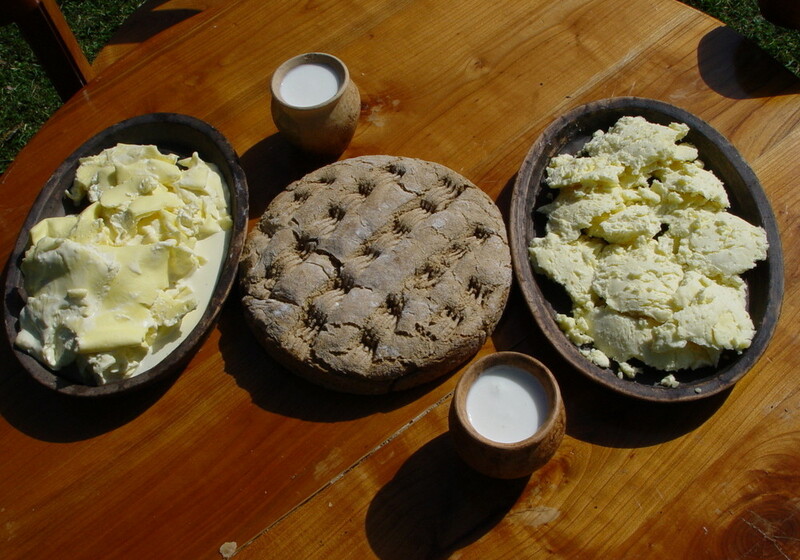 In both cases corn flour is cooked together with cheese and skorup (served with potatoes), but gruel is much stronger and more greasy, because a substantially larger quantity of skorup is added to it. Just like pies, flummery and gruel are served with sour milk. Should you try it? By all means. 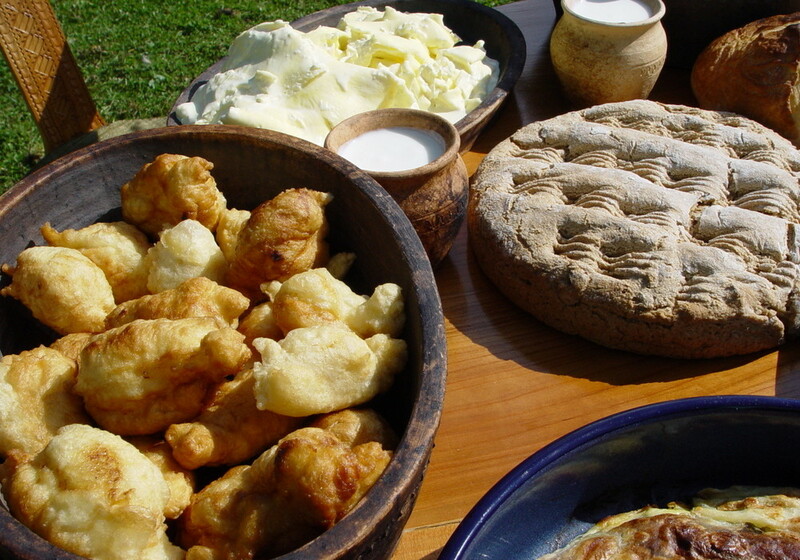 You should try all traditional dishes, regardless of how strange they might seem to you. In almost all menus you will come across a dish called “Durmitor supper”. 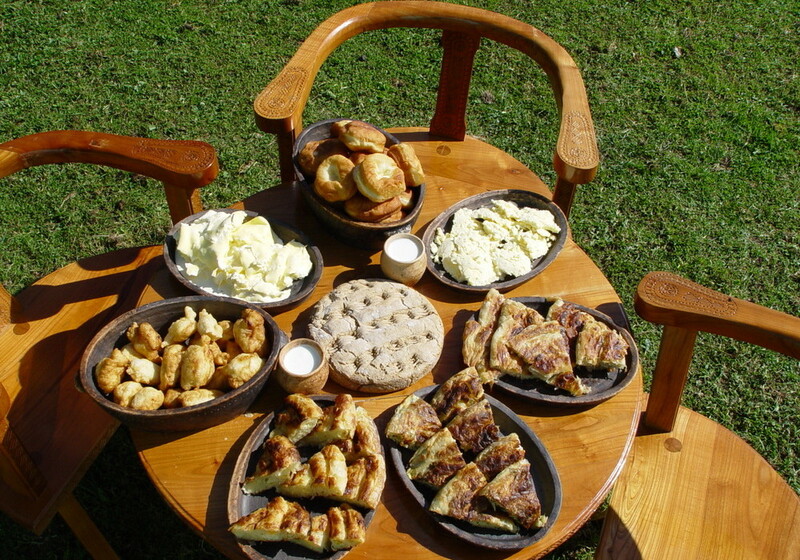 Unlike Durmitor-style steak which is not quite Durmitor-style, Durmitor supper is one of our typical suppers. In consists of potatoes roasted without oil (or cooked) and skorup, cheese and sour milk. Menus in local restaurants are quite rich. We shall not enumerate all the dishes you can order, rather we will single out some of them which are typical of this area. 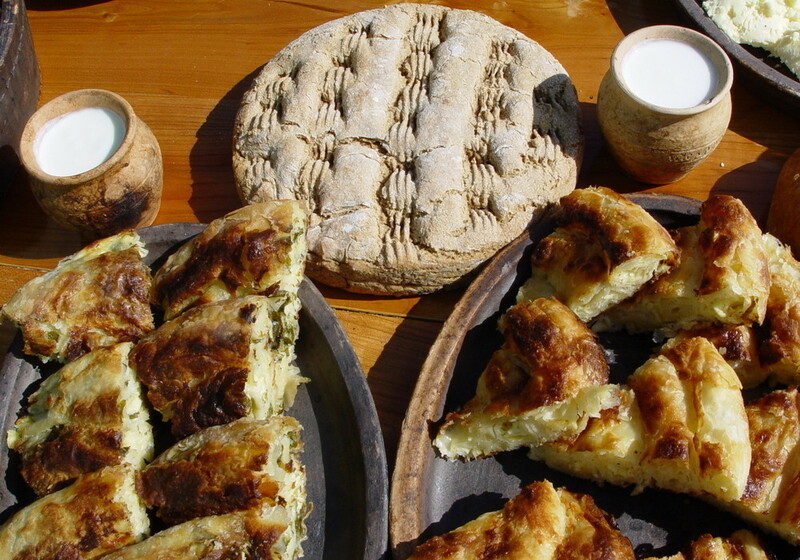 Durmitor produced lamb is ranked first on our list. Local grass makes it very delicious, so you should on no account be afraid of being served lamb with a strong smell, which is typical of low lands and marsh areas. 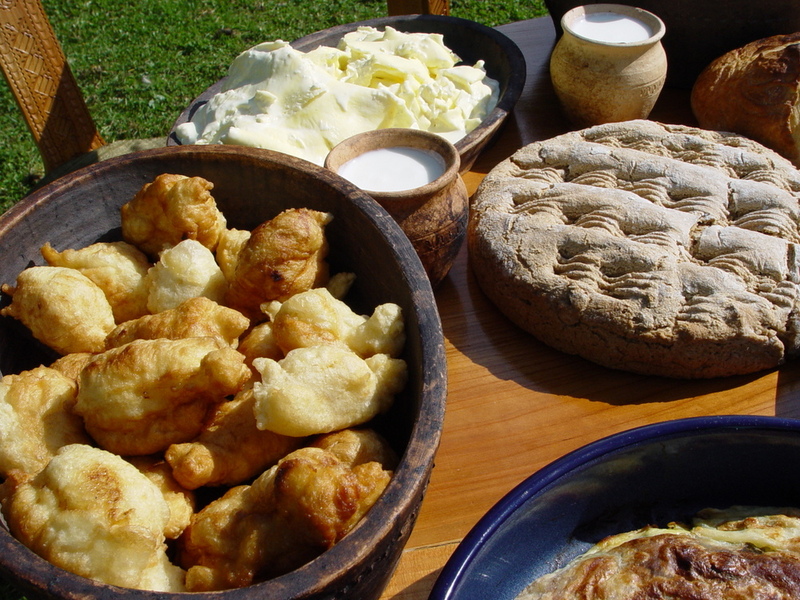 Lamb is roasted (jagnjeće pečenje), cooked (kuvana jagnjetina), cooked by steaming (jagnjetina na pari), cooked in a stew (dinstana jagnjetina), or roasted under the bell (jagnjetina ispod sača), which means in earthenware, covered all over with hot ashes. The process of roasting “ispod sača” can be seen in the roasting house, next to “Momčilov grad” restaurant. 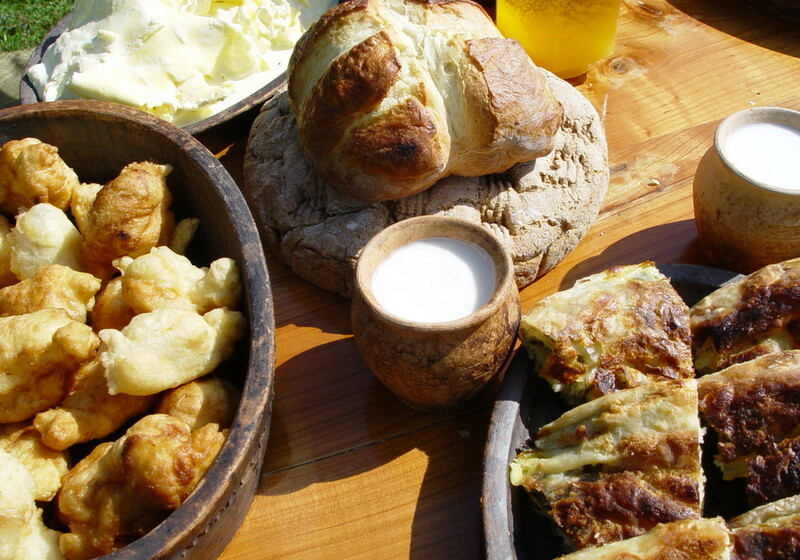 In addition to lamb, potatoes prepared in the same way are served. 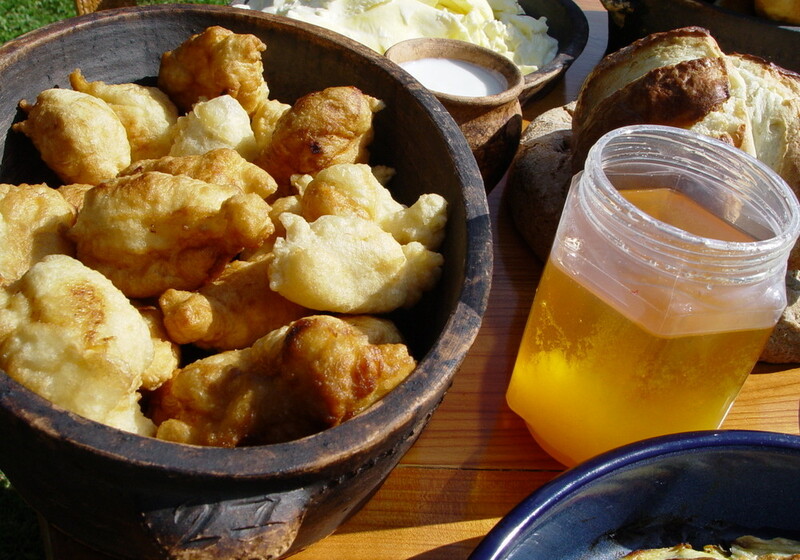 Fried lamb liver is also a real specialty, whereas for starters you should order homemade lamb broth. Veal is prepared in almost the same way as lamb. Roast veal, cooked veal, veal under the bell, veal broth etc. Besides these dishes, grilled veal and veal scallops are also tasty. The veal served here is still not available in the western countries or the EU, since the ban on slaughtering young calves has not been implemented yet (we are aware that what we have said sounds rather….cruel, but still, such are the facts). 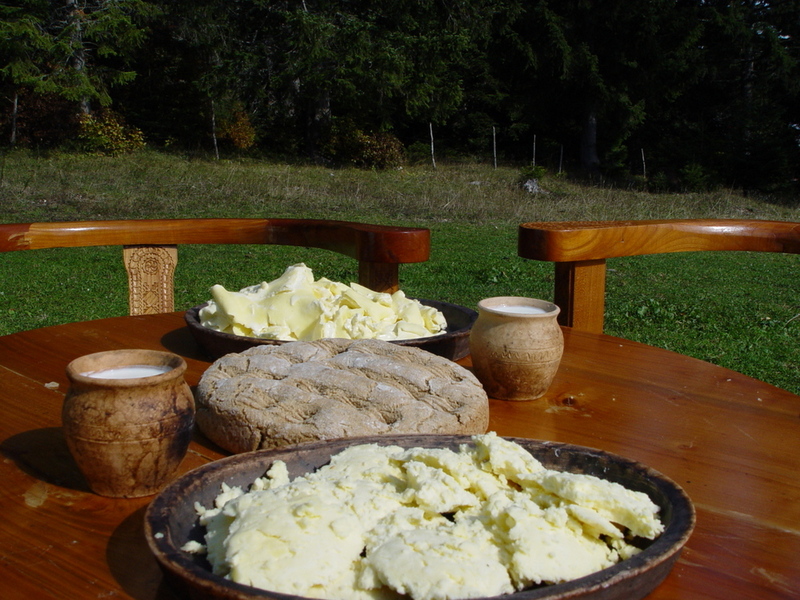 One of the dishes frequently recommended as a typical Durmitor dish is Durmitor-style-steak. It is a rolled, usually pork scallop, stuffed with ham and skorup. 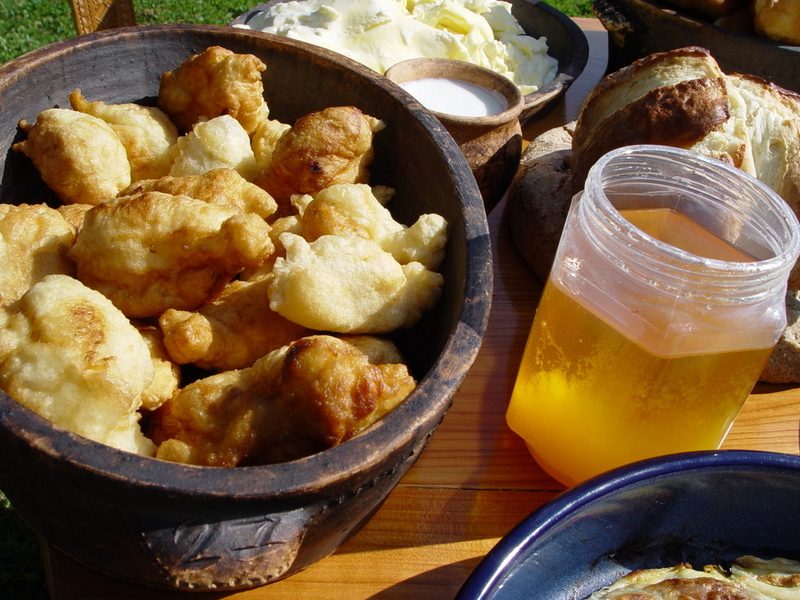 We think that this dish is not a traditional Durmitor dish and that it was invented for commercial purposes. A bit too strong for our taste but…. as they say, in matters of taste there is no dispute! A type of meat like the one produced on Durmitor in organic food shops in the West would undoubtedly reach a price that is a couple of times higher. Smoked, dry meat is also part of our traditional diet. Smoked beef and mutton, as well as beef sausages produced here can be found in small shops in Zabljak. 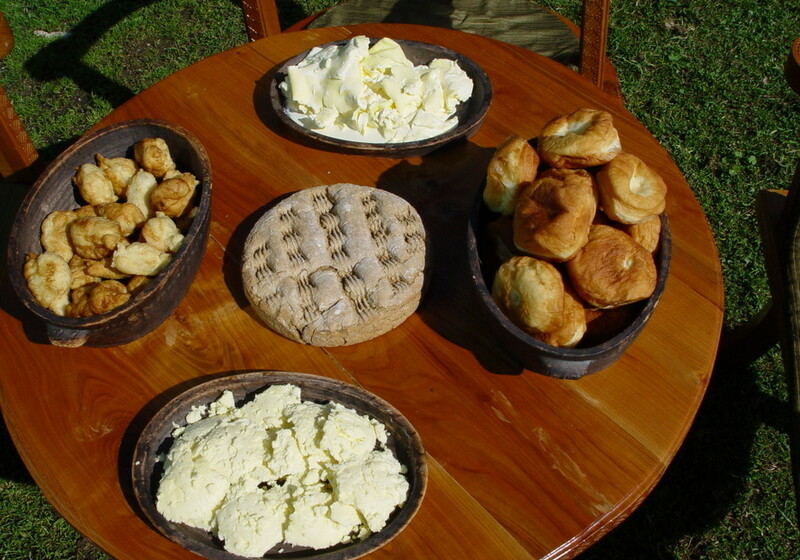 Of course, it would be unjust and improper to be absolutely locally-oriented and not to mention the famous Njeguski prsut (cured ham), which is prepared and dried in a special way in Njegusi village, near Cetinje, because spending your time anywhere in Montenegro without trying Njeguski prsut is an oversight for which there is no excuse! 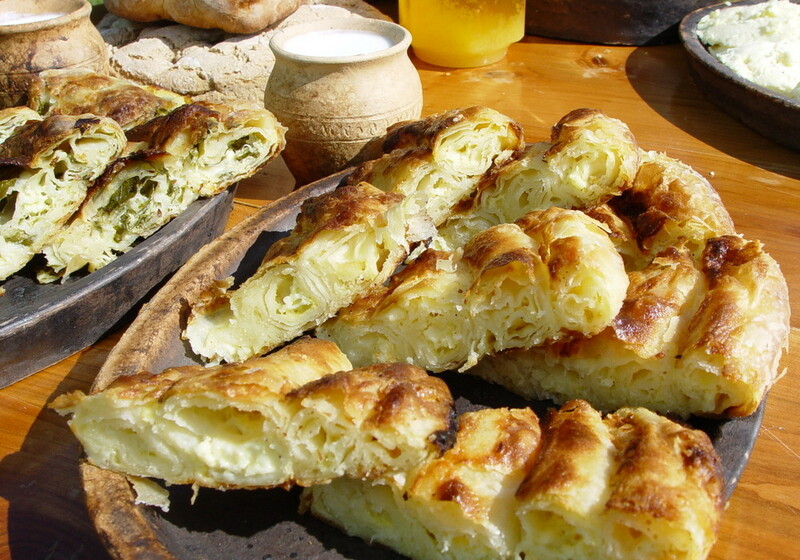 Njeguski prsut, sliced or in one piece, can be found in all grocery stores and all restaurant in Zabljak. 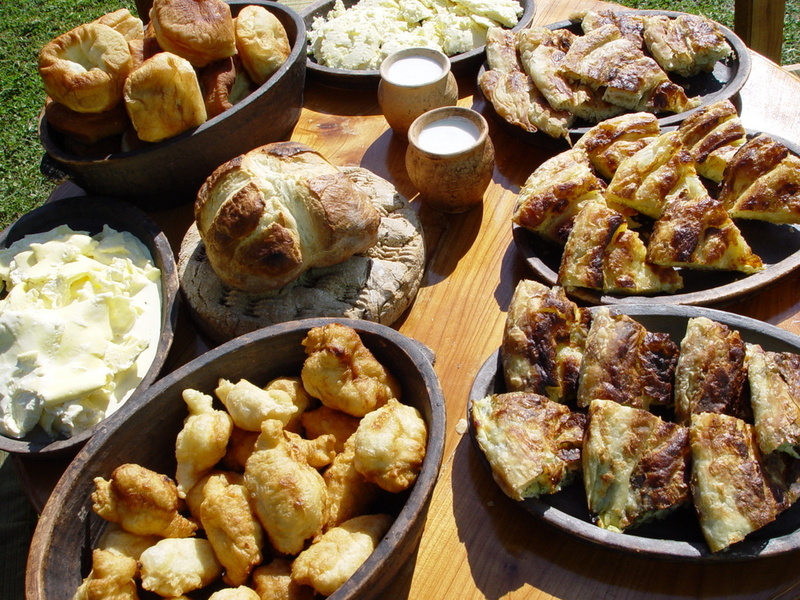 Dishes made of pork are represented in a large number of local menus, and should by no means be avoided, however, such pork is generally produced in other regions. We consume it either fresh or after it has been smoked. The pork is also of excellent quality, making the dishes made from it very delicious, but we keep insisting on locally-produced food since we consider it best to consume the food made in the area you are currently in and because we know that our lamb and veal are top quality meat types on offer nowadays. Of all the fish found in our restaurants, we recommend trout the most. Sea fish, squid and octopus are best eaten at taverns by the seaside. The trout offered here, in general, has not been caught in nearby lakes or rivers. It is bred in special pools and fed artificially, however, as living and breeding conditions are exceptionally good, the taste is excellent. For quality trout bred by man, the water it lives in and the quantity of oxygen in that water are extremely important. The existing pools in this area have been built near, or on, swift and clean streams. The fish, although artificially bred, live in conditions similar to those in their natural habitat and are delicious. 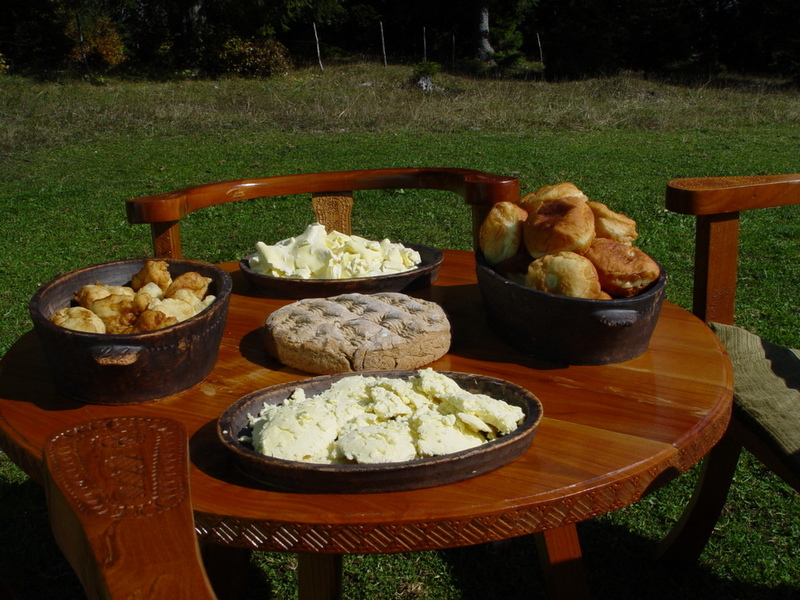 As far as fruits and vegetables are concerned, on Durmitor, with the exception of forest fruits, no other type of fruit can be raised. The reason is, of course, a harsh mountain climate. The exception to this is Tepca village, which is situated at a considerably lower elevation (about 800m above sea level), in the Tara Canyon. Even grapes are grown in Tepca! The fruit from Tepca is brought by the farmers to the town marketplace in August and September. At that time, on Thursdays, on market day, you can find apples and plums from this village, rather small and unpresentable, but extremely tasty and certainly not sprayed with chemicals or fertilised with artificial fertilisers. We suggest you try them. In July, forest fruits are also available, namely blueberries and forest strawberries that are self-grown. On the marketplace you will often find apples, cherries and wild cherries brought by farmers from eastern and southern parts of Montenegro. Just like fruits from Tepca, this fruit is typically smaller and less presentable than the one found in stores, but is very healthy and tasty. Grapes and peaches are also domestic fruits. The local stores and the marketplace are supplied with them by the “Plantaze” company from Podgorica, which also grows them. 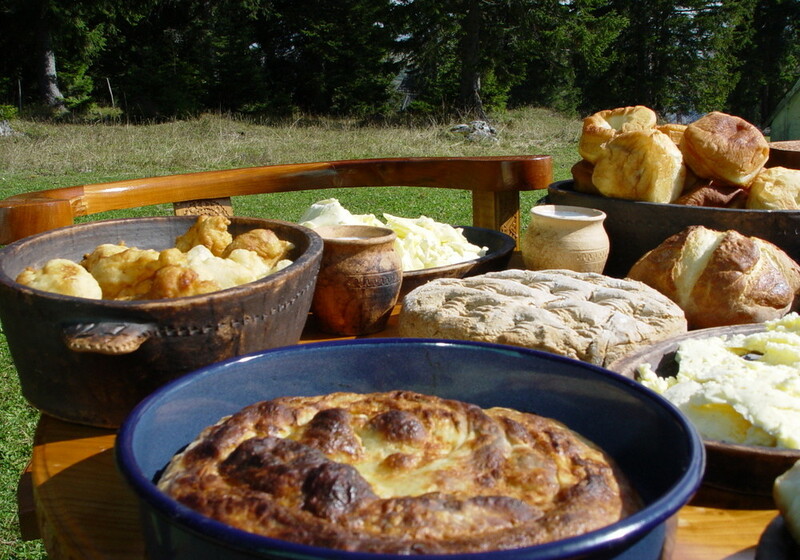 Vegetables grown on Durmitor (carrots, cabbage and beetroot) are ripe only at the end of summer and in autumn. Locally-grown potatoes are excellent, but, due to climate conditions again, they are fully grown only in autumn, so during summer, potatoes from other parts of Montenegro are sold in restaurants and in the marketplace. The same goes for other vegetables. Almost all vegetables are brought to our shops from southern parts of the country. Generally speaking, the vegetables you are eat here are delicious and grown without significant interventions when it comes to spraying and fertilising. It follows from what we have just said that people of Durmitor did not have much fruit and vegetables as a part of their diet. 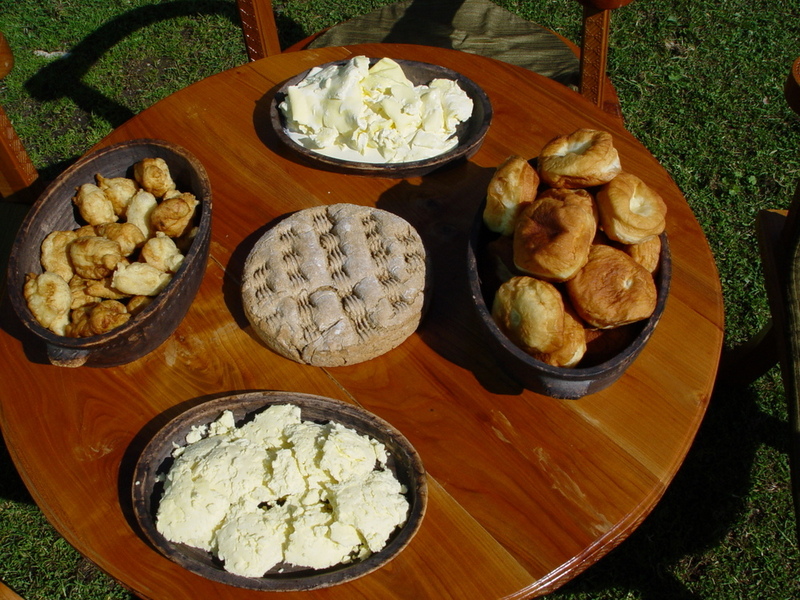 Apart from potato, which was a side dish to almost all dishes, the most consumed vegetables were cabbage and beans. Sauerkraut, fresh or cooked with dry meat, is a frequent winter dish around here. 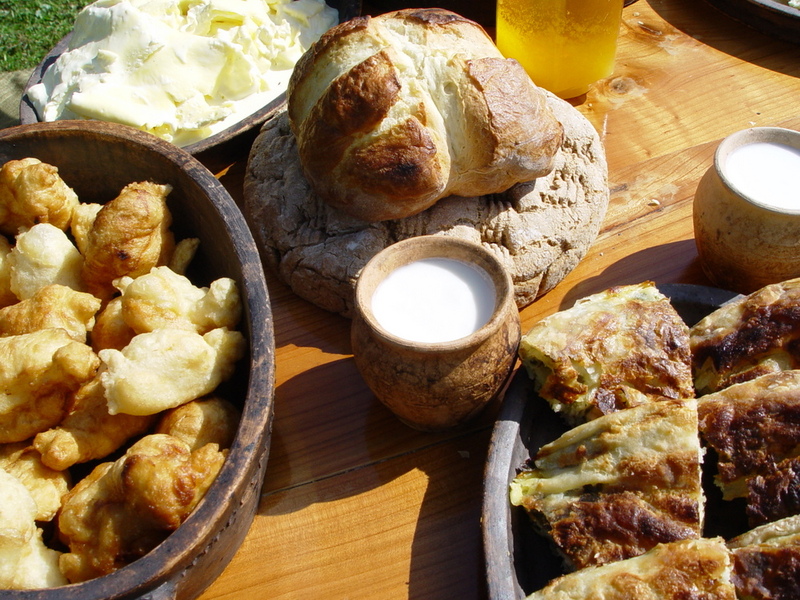 In almost all households, cabbage is salted in autumn and put in barrels where it turns sour and is eaten during entire winter. Other vegetables (pepper, carrots, cauliflower) are prepared in a similar manner. 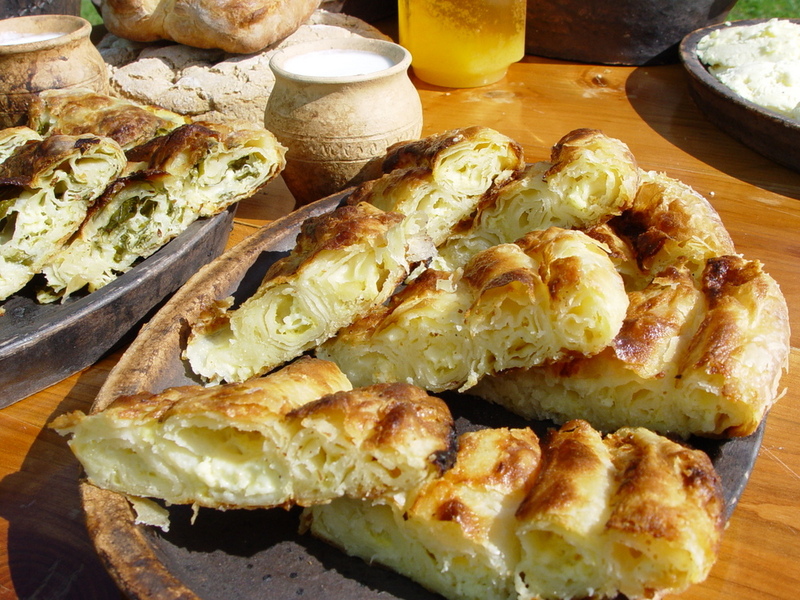 Cabbage rolls from sauerkraut, without which one cannot imagine New Year’s Eve, are widely famous. Restaurants often offer salad and dishes from sauerkraut with smoked meat. We like them a lot and suggest you try them. Look out for menu names Kiseli Kupus and Sarma. Mushrooms boletus, chanterelle and morel from the Durmitor mountain and forest ranges are found in most restaurants menus. If you would like to try them, you will almost certainly find them in restaurants “MB” and “Javor”. 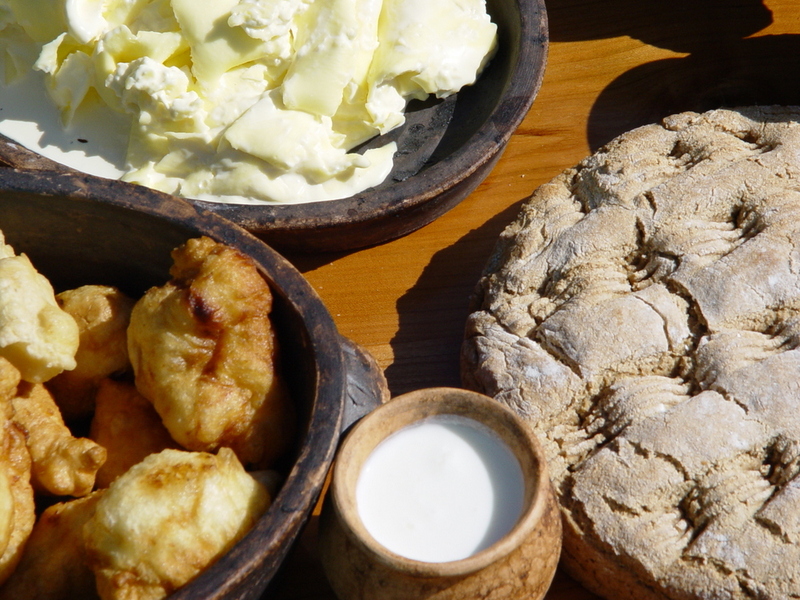 So much for traditional Durmitor dishes…we think and hope you will really enjoy our local food. 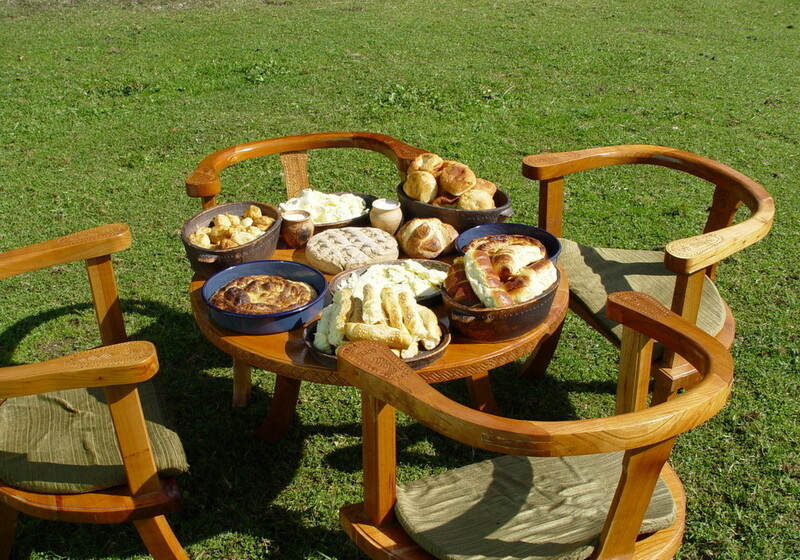 However, in between trying our local food we understand you may also like to eat food that you are more accustomed too. 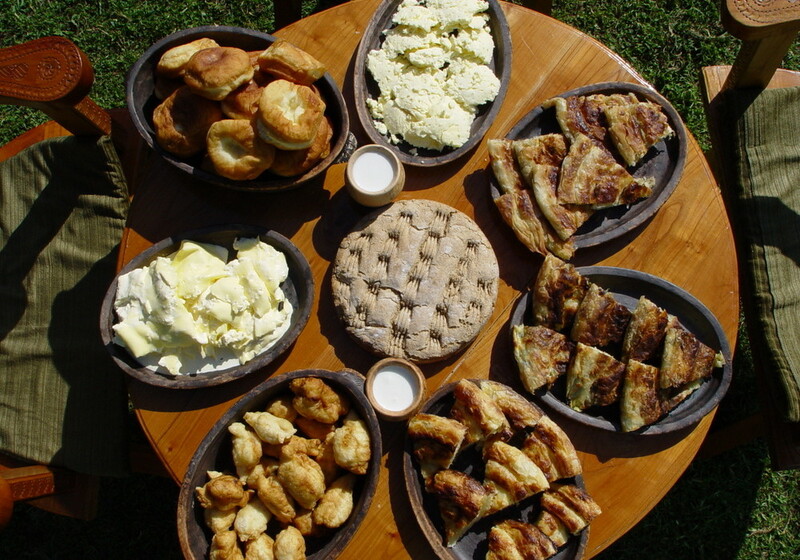 If you wish to eat the food you are used to having at home, such as pizzas and pasta etc, you can have pizza in “Picerija” and in “Zlatni papagaj” cafeteria-restaurant, in downtown Zabljak. 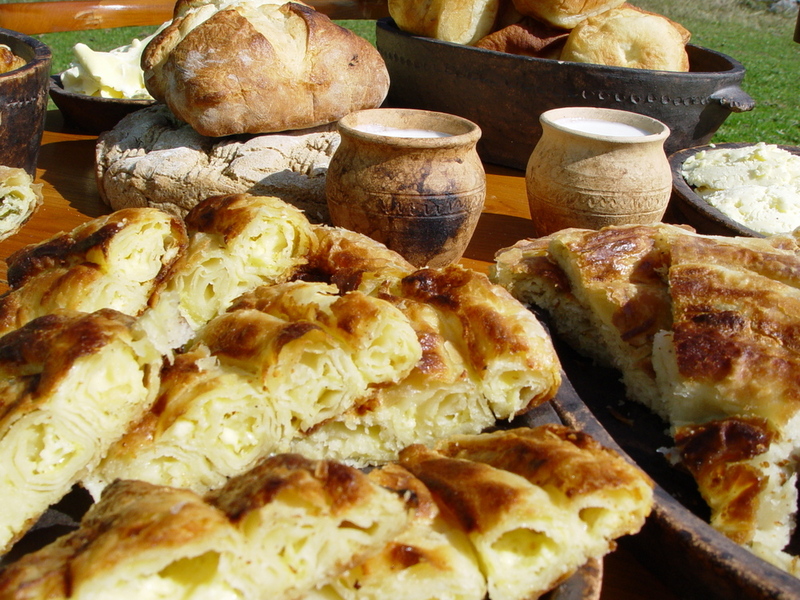 Besides pizza, in “Zlatni papagaj” they prepare excellent pasta as well as traditional dishes. Since there are no fruits on Durmitor itself, it is logical that we do not have our homemade alcoholic beverages either. The exception is, again, Tepca village. In almost all restaurants and pubs you can order homemade fruit brandy made from plums, apples, pears or apricots, which is made in Tepca, or in villages in neighbouring municipalities where fruits are successfully grown. Fruit brandy and grape brandy are produced by large companies for the production of alcoholic beverages. We recommend grape brandy “Kruna”, produced by “Plantaže” company and pear brandy “Viljamovka”. If you are lucky you will also get to try brandy that has been made (distilled) not by large companies but within family homes and farms. If you get the chance to try this more local variety e suggest you do not pass it up. The beers from the territory of former Yugoslavia are excellent quality. Do not avoid them!”Nikšićko pivo” is the only beer produced in Montenegro and is well worth a try. When it comes to wines, we recommend all wines from the Montenegrin company “Plantaže” – which you will find in almost all restaurants. 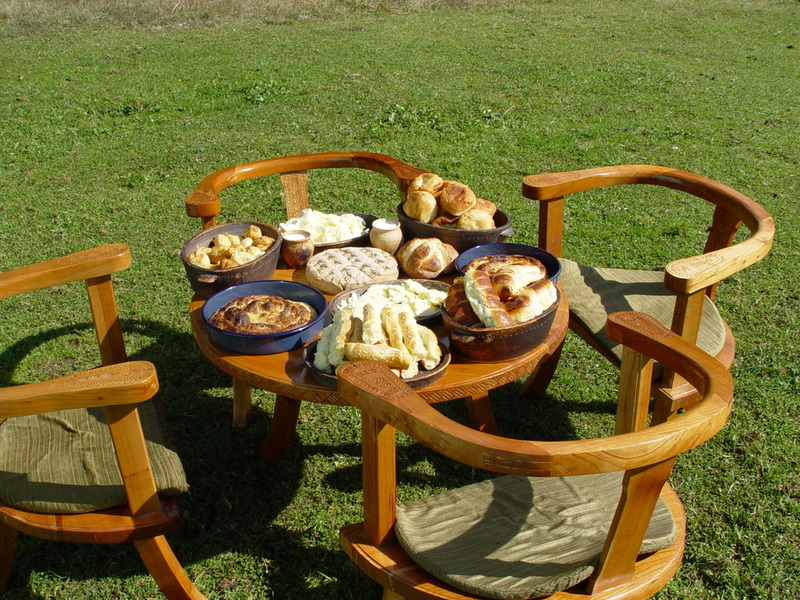 You can order several types of coffee in restaurants and cafeterias. The coffee drunk mostly in Montenegro is called “Turkish coffee”. 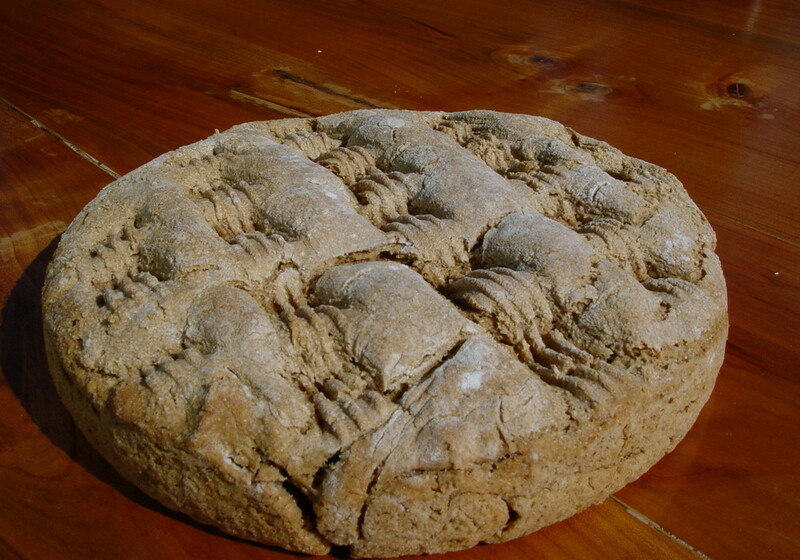 It you have not tasted it yet, try it with or without, a little sugar. After you have drunk it, you can turn over the cup and from the figures thus formed by the coffee gain sediment you can see your destiny! In short, if all the figures are large, shiny and dark – there is nothing for you to worry about. Everything will be perfect! “Telling your fortune from the cup” is an integral part of coffee-drinking ritual when it comes to women! Our attitude towards tea is rather…well, let us say unformed. Tea is here associated with weakness and illness, so you should not be surprised if a waiter starts enumerating tea types beginning with chamomile, mint etc. In some cafeterias you can find a good (when we say “good”, we primarily mean known brand) black or green tea, but do not expect milk being served with it. Although tea is here almost synonymous with medicinal herbs potion, and although such tea is drunk in houses in large quantities, it is almost impossible to find in cafeterias. 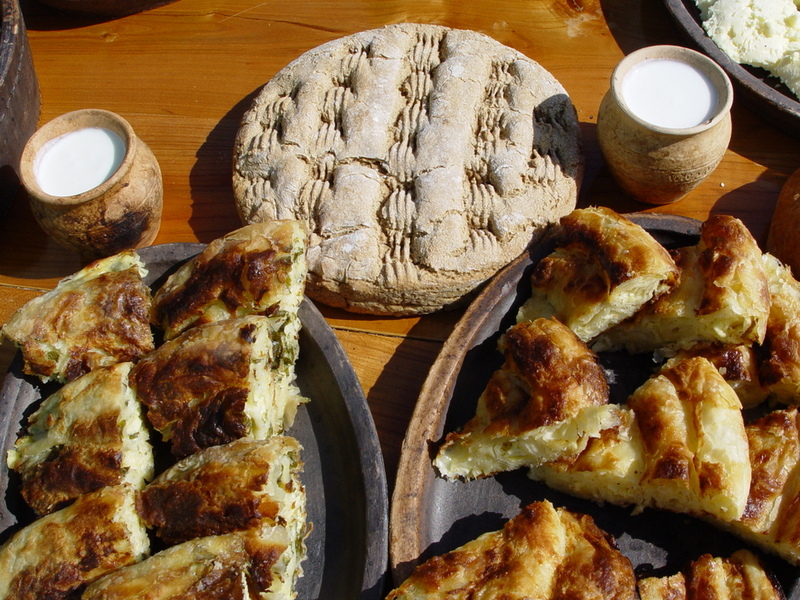 Try “Zlatni papagaj”, or cafeteria “Dvorište”. In “Zlatni papagaj” homemade juices are also frequently on offer. 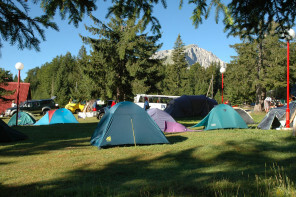 Or ask us as the camp, as we usually have local mountain tea for you to try or buy.